How does a good book kill the hours? That reverse-Narnia effect of a page-turner – as effective at eating up trans-national flights as long afternoons on the sofa. A novel worth its salt has a number of tricks to stop you going about your daily life and one in particular that always fascinates me is the seductive, alternate world – different but somehow comforting. I believe speculative fiction does this better than most, but what is it that keeps us going back to megacities, citadels, hive worlds? Because, for all their otherness, they’re familiar. When I wrote Ruin’s Wake, I wanted to emulate my idols and focus on the texture of place: the first tome I fell in love with was Frank Herbert’s Dune, as much a love letter to geography as a tale of manifest destiny. When I return to Arrakis I smell cinnamon on the air and the winds dry my skin because Herbert’s writing is saturated with detail pulled straight from North Africa. He talks of wadi and bled; the constant battle to preserve moisture; the winds of the deep desert are worshipped and feared. On the face of it, this planet of Herbert’s is the lynchpin in a galactic power struggle where death troopers clash with tribesmen riding kilometre-long worms but none of that distracts or rankles because there are so many familiar touches to anchor us: take a walk through any city in Morocco and you’ll see the origins of Arakeen’s water sellers in every shopkeeper calling out to you. There’s a pattern with my favourite writers, and it’s that they pluck out the known to make the unknown sit well with us poor, earthbound creatures. Take a look at Adrian Tchaikovsky’s Children of Time, where a civilisation of spiders grows from primitivism to reaching for the stars. Plenty of folk hate spiders; I don’t exactly love them, but I challenge anyone not to care about the Portias and Biancas as they struggle down the road of evolution because Tchaikovsky litters this, ostensibly, alien culture with recognisable challenges. Facing down an overwhelming, barbarous horde of ants (Tartar/ Mongol invasions); religious fanaticism (the apogee of the Inquisition); coping with a pandemic (Black Death, anyone? ): we see parallels of our own history that make the unfamiliar fascinating, not alarming. You’ll never look at a web the same way. I’ve anchored my own work in the real world (shoulders of giants and all that). I wanted to write an adult, convincing dystopia so I went looking for my real-world exemplar; I found it in North Korea. I never set out to write a history of that country (nor do I have the talent of Orwell to extrapolate its future) but I found manifold examples of life under an oppressive, information-poor regime that could lend my world grit and grime. In Kelbee’s apartment there’s a wall reserved for a portrait of the Seeker: this is lifted wholesale from a filmed visit to a Pyongyang apartment: the smiles were staged and everything made to appear just so, but that detail of a cramped apartment reserving a whole wall for three little portraits stuck with me. Heating mausoleums while power cuts roll around the capital, propaganda as part of daily life, overblown military parades – I didn’t make any of these up. In a nod to Herbert, I took some of the more bombastic DPRK news broadcasts of the last few years and used it to shape how some characters speak: if there’s something a little melodramatic about how Fulvia addresses the crowds, just look up transcripts of state proclamations when last the Kim administration decided to clean house. 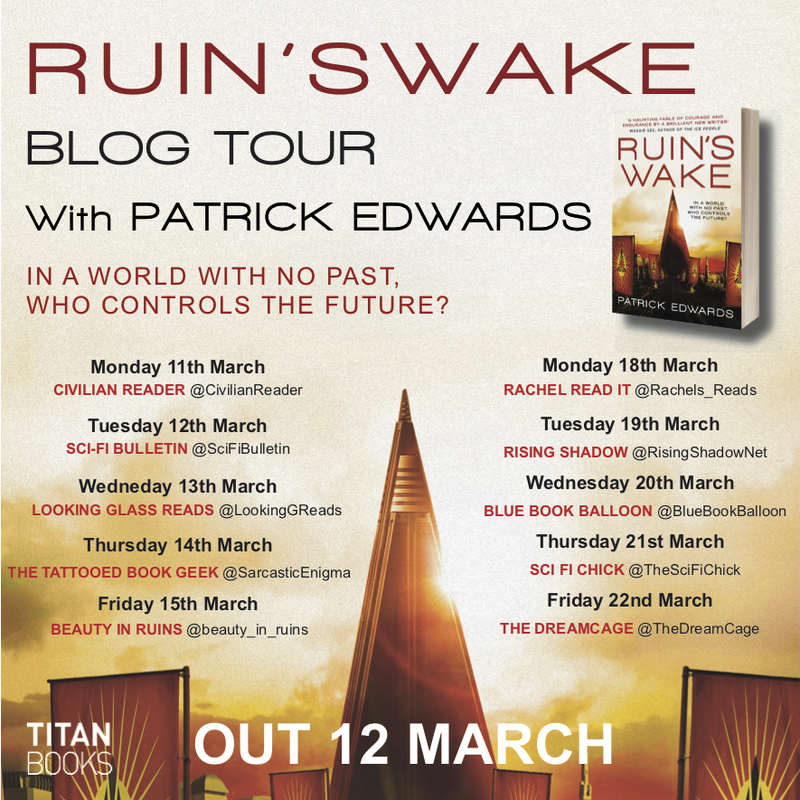 The DreamCage would like to thank Patrick Edwards and Titan Books for sharing this article with us. Ruin's Wake by Patrick Edwards is now available to buy.